This fall back thing. Seems ridiculous. Why do we do it? Every year it is a shock to our systems, this sudden plunge into darkness every evening, the rush to get chores completed only to discover it is 5:15pm. 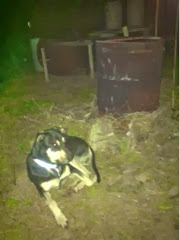 The burn barrels are going because it is a challenge to work in the dark and cold. Chaz is happy right there next to one of them, but we all wonder why this whole thing is needed. I'm ok with the gradual loss of daylight hours from now until December, and the gradual increase in daylight that happens as we get to be closer to the sun. Just can't understand the need to adjust clicks twice a year.